Oregon is one of three U.S. states bordering the Pacific Ocean. 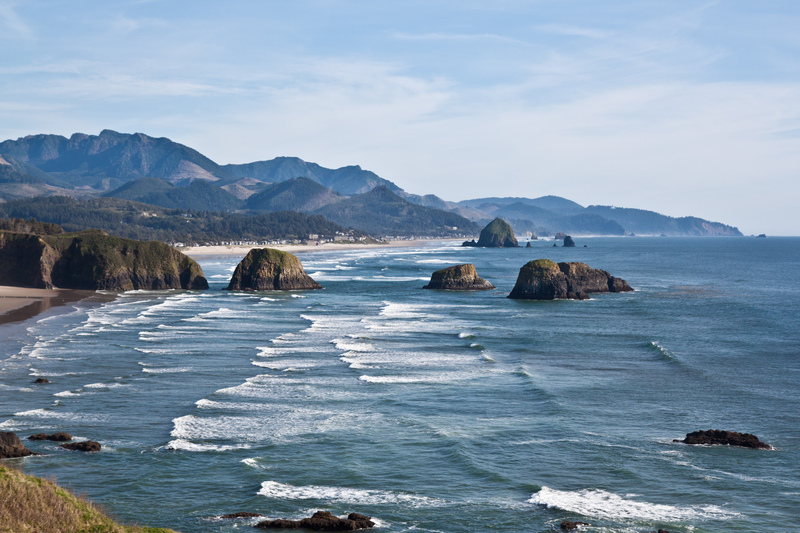 Beaches in Oregon are some of the most beautiful places you’ll find on the Pacific Coast. Oregon is situated below Washington and above California along the west coast of the United States. The ocean water along the Pacific coast here flows down from the Arctic, and many people find the region too cold for swimming. In Oregon in particular, storms, rip tides, and cool waters means that people don’t flock to the coast to swim. The rugged beauty of Pacific beaches in Oregon are still well worth a visit (donning a wetsuit of course). Short summers and moderate coastal temperatures make the state a perfect destination for whale watching, rock hunting and general exploring. These activities are popular with residents and tourists alike. Inland, you’ll find freshwater lakes and rivers. There’s plenty of kayaking, canoeing, whitewater rafting and fishing. The swimmable lakes about an hour’s drive from Portland are especially popular. Waters remain cool, but the natural watering holes are magnificent. If you’re the adventurous type, you’ll enjoy hikes to pristine waters with natural stone and sand beaches.